In response to the Yachad party’s growing support in the dati leumi community, Bayit Yehudi is distributing a new pamphlet written by rabbonim who support the party. The message sent to readers is a simple one, that Bayit Yehudi has never operated with such an attentiveness to rabbonim in an effort to portray the party as being more religious than in the past. The rabbonim address accusations that the party under the leadership of Naftali Bennett is as religious as it should be. They state that the contrary is true, that the party is more religious and connected to rabbonim than any time in the past. On the other side of the dati leumi coin, Rabbi Shlomo Aviner is distributing his new pamphlet which is against Bayit Yehudi but in support of the Yachad party. Are you distorters or just can’t read or comprehend well? I will give you the benefit of the doubt and assume the latter. What is written in the article and what the headline says are not the same thing. In fact they are opposites. Could YWN give us the list of rabbis supporting Bayit Yehudi? Losing Rav Aviner to Yachad is a big loss. and those Rabbanim told them to support legislation to round up thousands of hareidim and put them in prisons, and close down the hareidi yeshivos???????? 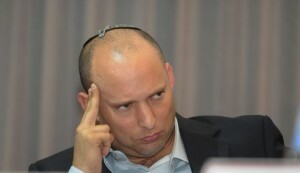 and those Rabbanim, who are almost all fanatic supporters of keeping the West Bank under Israeli control, told Bennett to make concessions on national security and territorial issues in order to further the “war on the hareidim”?????? #1, you probably misread the article. It matches the headline perfectly. The point is that the Dati Leumi shita is that Daas Torah is not binding and the Rabbonim agree with that. Therefore the Dati Leumi rabbonim endorse the party. (I guess it kind of is a wrong headline since at the end of the day they do listen to their Rabbonim by not listening to them). #4. That’s nonsense. They are unlike the Chareidi parties where the Rabbonim are very political, make political statements and threats. Rabbonim should give Halachic guidance and stay out of direct partisan politics that has nothing to do with Torah related issues. It only diminishes them and harms people’s view of the Torah. where do you draw that vague distinction?